RUSH: I want to take a brief moment and make a brief departure from the usual direction of the program to introduce to you the international film and television star, the Peabody Award-winning Nick Searcy. 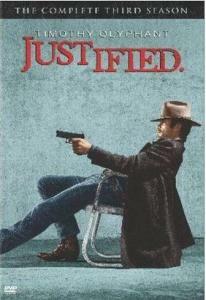 He’s starring at present in the FX mega hit Justified, which is an absolutely fabulous show. Nick, I mentioned the other day, I guess Wednesday, that I was happy that Nick finally returned. He plays the leader of the sheriffs, the marshals, Art, on the program. I missed you in the first episode. I saw you in the credits so I knew you were gonna show up. I’m glad you did. SEARCY: Absolutely. I’m glad I did, too. RUSH: Are you guys through shooting the season? Is it over with? Have you finished it? RUSH: You got 13 episodes again this season? RUSH: You have got five to go. Do you shoot it on location? SEARCY: We shoot it in Valencia, California, which they cleverly try to double to look like Kentucky, which is good. RUSH: They do. I guarantee you. RUSH: They’ve pulled it off. Well, you know, it’s interesting. I was mentioning it to the audience and telling them about the show, because I think it’s a great show. The people that you have on that program, including you, are some of the best. As I’ve gotten older, I’ve learned to appreciate what you do more than I did when I was young. I think it takes real talent to just lose yourself and become somebody else and not go crazy at the same time. SEARCY: (laughing) I’ve noticed that this season, there’s no bad guy. It seems like you have two parallel story lines. You have Boyd Crowder, and what’s happening to him; then you’ve got Raylan, what’s happening with him. It’s a whole new feel, ’cause there’s not a singular bad guy this season, Nick. SEARCY: Yeah. There’s not just one big super villain that we’re trying to take down and I think they did that intentionally to, you know, try to take the show in a new direction and mix it up a little bit. We’re getting the opportunity to focus on the lives of some of the other marshals in the office which I think is a good thing. I think they should focus a little bit more on me just for ratings. RUSH: I did notice that they outfitted you with some Pappy Van Winkle. SEARCY: Yes, they did! Yeah. RUSH: That’s very, very tough stuff to get, and you got a bottle, and now you’re already sharing it. RUSH: Now, you were in Moneyball, right? SEARCY: I had a little bit in Moneyball, yeah. I was one of the scouts at the table there. You know, in the last couple of years I’ve done a few movies here and there. I was in the Ugly Truth not too long ago. RUSH: I have to ask you… Again, I’m asked by people all the time about this. Hollywood is perceived as the haven for people who are Democrats and liberals, and you’re pretty public with your conservatism, and yet you get your roles. You get jobs. Have you found it a problem for you personally? SEARCY: Well, you know, it could be. I mean, it’s not the kind of thing where they call you up and go, “We’re not gonna hire you because we hate you because you’re a Republican.” You know, I’m sure it happens. You know, if I wasn’t I might be working more. I mean, I know plenty of actors here who have stories that they know about, that either powerful stars of the movie or producers who found out that they were contributors to Republican candidates or whatever shut ’em down. I mean, I know that it happens. I just don’t know that it personally has happened at me. But I figure that I’m just so likable, everybody loves me. I figure that’ll trump whatever hatred they have for me being a conservative. RUSH: Well, it’s apparently true. RUSH: I mean, you’re a noted presence on Twitter. You have a tremendous following. RUSH: You’ve got a great sense of humor. And, by the way, they don’t write that in much, but you can tell. People who know to watch the right things can tell that you have a great wit. Now, for people that don’t know, Justified is an adaptation of a novel — a short story, actually — written by Elmore Leonard, and he still gets producer credits. Is he ever on set still as you shoot? SEARCY: — that was both based on the show and that the show used excerpts of to create storylines. So I was telling him that, you know, is there a novel named Art in the works? Do you have that in your head somewhere? He didn’t really take that bait. RUSH: (laughing) Your show premieres the middle of January; it runs for 13 weeks. When did you start shooting? SEARCY: We started shooting mid-October, maybe early October, and we wrap around March 1st usually every year. RUSH: And it’s solid? It’s every week, maybe except for Christmas? RUSH: I’m sure for Martin Luther King Day you take off, like I’m gonna do this year, and other noted holidays. But you pretty much work through. Have you gotten anything else in the pipeline when this finishes? SEARCY: Actually I’m gonna do a play out here in LA for the first time in 20 years. I haven’t done a play since, but it’s kind of a pet project and a good one. RUSH: They have stages — I mean theaters — in LA? SEARCY: (laughs) Yes. People actually do go to them, yes. SEARCY: And that play is called Billy and Ray, and Garry Marshall is gonna be directing it, which is gonna be fun. But the other thing I have in the works is my acting school project, which is ongoing. It’s a public service that I provide to my fans so that they can learn what it’s like to be an international film (garbled). RUSH: Now, let me tell you about this, folks. Nick here is presenting this humorously. You don’t quite know Nick’s sense of humor, but this acting school of his is uproarious. Where can people find this, Nick? They’ve got to see this. Web addresses on the radio are tough. Can they find you on Twitter and then find your acting school? SEARCY: No, it’s very easy. It’s just my name. It’s just like RushLimbaugh.com. You just go to NickSearcy.com and there’s a little icon up on the right that says “Acting School,” and you click on that, and the learning begins right then. RUSH: Yeah, and never stops. SEARCY: (laughing) It never stops. Just like your show. RUSH: Okay, it’s S-e-a-r-c-y. That’s how Nick spells his last name. So it’s NickSearcy.com, and the icon in the upper right-hand corner is for the acting school. RUSH: Let me tell you, you guys are all great. I mentioned earlier that as I get older I have a greater appreciation for a lot of work that people do that, in younger days, I used to think was easy. Now, I’m just a fan. I don’t know how to rate what you do professionally. All I am is a consumer. But I have to tell you that everybody that I know loves this show. You all look like you’re having a ball doing it. You all look like you’re really totally immersed in it, that nobody’s phones it in. I think the audience doesn’t feel cheated watching this thing, and it’s unique. You know, it’s the kind of thing that everybody wishes they could be part of, Nick, to tell you the truth. It’s that good. It’s that kind of show and the guest stars you bring on, they add to it, too. So congratulations. It’s a great show and it looks like you’re just having a blast with it. SEARCY: Oh, we are. You know, it’s been such a joy to go to work every day with these people, and Tim Olyphant is just a terrific star, and he’s one of these guys that’s so engaged in the material. His enthusiasm for it is infectious, and it pulls everybody in. The writers have done a wonderful, wonderful thing in allowing the actors to really massage the scenes, and the writers are always there on the set with us. So that if somebody has an idea or a change they want to make or an ad-lib they want to throw in, everybody is in on it so nobody gets mad. RUSH: Managing those egos is unimaginable to me. For example, the season that you had Margo Martindale. That character, she portrayed that character… I still marvel at it. I still go back and I watch replays. I imagine it was a challenge for the writers to kill her off, because they coulda gotten another season out of that whole storyline if they wanted to. But that’s, I guess, a testament to the discipline to come up with something new so that nothing gets old. RUSH: (laughing) But I finally got you. SEARCY: It was funny. I remember when you talked about Marlow last year. SEARCY: You’ve mentioned some of the other actors before and they never knew about it, ’cause they don’t listen. RUSH: Yeah. I wasted it all. That’s an excellent point. I wasted it all. RUSH: I wasted it all. RUSH: And you’re the one that makes the show. It can be said here. RUSH: It can be said here. And, by the way: Now, Nick, you’re the only one of the show that’s been here. RUSH: I mean, that’s big. SEARCY: Well, I have to tell you one story, though, ’cause you made an appearance on the set of Justified one day. We were doing a scene, Tim Olyphant and I, and I had my phone in my pocket. And of course, like every decent American, I have the Rush 24/7 app on my iPhone so that I can listen to you. As I was walking through the office during the scene, somehow my pants brushed up against the wrong button on the iPhone and your voice started playing during the scene. SEARCY: During the scene. Right in the middle. RUSH: Oh, no, and they cut it out? SEARCY: And I turned to him and I said, “Wait a minute. How do you know what Rush Limbaugh sounds like? You only heard about five words out of his mouth. Are you a listener?” (laughing) And he wouldn’t answer me. SEARCY: But it was great. RUSH: Nick, thanks again for calling. I tell you, it’s great to finally meet you and have you here. Congratulations and all the best to you in your future endeavors. SEARCY: Thank you, Rush. It’s such an honor for me. It’s one of the biggest days of my life. RUSH: Thank you. Tell ’em we all said hi, too. RUSH: I really appreciate that, Nick. Thank you so much. I really do. RUSH: Nick Searcy, folks. Nick Searcy of Justified.